Wednesday, 17 January 2018 from 5:30 PM to 9:00 PM + Add to calendar17/01/2018 17:3017/01/2018 21:00Australia/SydneyPHILLIP HENRY & HANNAH MARTIN "EDGELARKS" (UK) in Concert at The Metropole for 'Metro Social' Katoomba, Blue Mountains - WED 17th January 2018PHILLIP HENRY & HANNAH MARTIN "EDGELARKS" (UK) in Concert at The Metropole for 'Metro Social' Katoomba, Blue Mountains - WED 17th January 2018 Wednesday, 17 January 2018 from 5:30 PM to 9:00 PM (AUS Eastern Standard Time) Organiser Charity Mirow 0409042869 info@fusionboutique.com.au Address The Metropole Guesthouse, upstairs "Metro Social" Cnr of Lurline and Gang Gang Streets Katoomba NSW 2780 Australia Event web page: https://www.stickytickets.com.au/58682/phillip_henry__hannah_martin_edgelarks_uk_in_concert_at_the_metropole_for_metro_social_katoomba_blue_mountains__wed_17th_january_2018.aspxThe Metropole Guesthouse, upstairs "Metro Social"
Phillip Henry and Hannah Martin return to Australia in January 2018, performing at Woodford, Cygnet and Illawarra Folk Festivals, plus shows in Brisbane, Melbourne, Hobart, Sydney, and Katoomba. Launching their new album under a new name: “EDGELARKS”. Edgelarks fly in on the tailwind of BBC award winning duo Phillip Henry and Hannah Martin. The new band name comes with a new project, that takes the roots of their previous work, from the traditional musics of the British Isles to Indian classical slide guitar to the stomping roots party of Henry’s beatbox harmonica, and adds a strong stem of original writing, running wilder with each repeat play. The duo began their musical journey together while living in a small caravan in the hills near Exmouth, Devon. They were playing in alt-roots outfit, traveling from festival to festival, tent to tent, wandering the highways, byways and old forgotten pathways of these islands; following in the footsteps of the ancient troubadour tradition, picking up tunes, songs and stories along the way. Spotted busking on the seafront at Sidmouth Folk Festival by champion of independent music Steve Knightley, they soon found themselves touring nationally, supporting the likes of Show of Hands and Seth Lakeman, and eventually winning the prestigious “Best Duo” award at the 2014 BBC Folk Awards. EDGELARKS (both the name of the new album and to be the new name for the duo) is about transitions. Their most innovative work to date, bringing a palette of new textures, the album explores the idea of the liminal: places, people and times, the straddling of boundaries and thresholds. Crossroads and borderlines; travellers and refugees; dusk and dawn; the pause between an old way and a new. The idea that, despite often being places of marginalisation, these are also places of change – and therefore places of hope. That in the end we have far more in common than things that divide us, because we are all liminal: standing on the threshold of tomorrow, we are all just passing through. 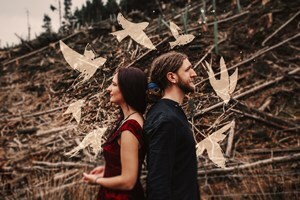 The Lancashire/Devon duo made their first appearance in Australia in March/April 2015, performing to standing ovations at Port Fairy Folk Festival, Blue Mountains Music Festival and Fairbridge Folk Festival, as well as a string of house concerts, folk clubs and music venues. They return in January 2018, launching their new album, some of which was inspired by their experiences on tour here, particularly in Tasmania. ~ Winner “Best Folk Duo”, BBC Folk Awards 2014. ~ Nominated “Best Folk Duo”, BBC Folk Awards 2016.